We all know the old saying "Practice makes perfect." This is very true for the sport of basketball. To become skilled at the game you have to commit a great deal of time honing your skills. This becomes very difficult if you don't have a basketball hoop close by. However, hooking up a basketball hoop to your garage can be unsightly, while installing a permanent basketball hoop in the ground does not allow for any portability. Today, the portable basketball hoop is a great addition as it can be moved when needed while not taking up much space. Below we have compiled what we feel are the three best portable basketball hoops based on three categories: Least Expensive ($200-450), Mid Range ($450-750), and High End ($750+). To make our decision on the best portable basketball hoops we looked at several factors. First, we took in the user rating based on Amazon. Second, we looked at the actual features of the hoop. Third, we looked at the price. We hope this guide can make finding the perfect portable basketball hoop as easy as a layup. ​​​​Use our portable basketball hoops summary chart to fast track your way around this page to any hoop on our list that you are interested in. To jump to a hoop simply click on the basketball hoop name. 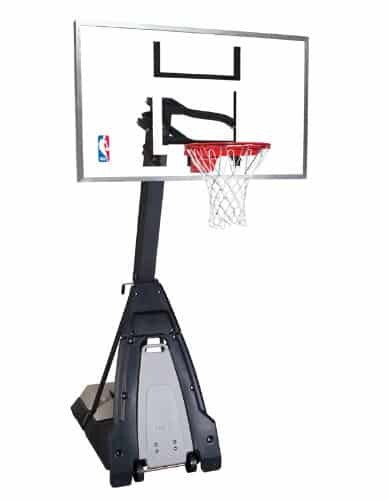 The Lifetime 1529 portable basketball hoop is the least expensive option on our list coming in at around $200. It is a portable, height-adjustable basketball system. The backboard is 50 inches wide and made with a shatterproof polycarbonate. While polycarbonate is durable, it does lack the responsiveness of more expensive backboard materials such as acrylic and tempered glass. The base of the hoop can hold 27 gallons of water to keep the unit stable. This is a smaller base so we do not recommend you dunk on this hoop or leave it in an environment with the possibility of high speed winds. The height of this basketball system can be adjusted from 8 feet to 10 feet in increments of six inches. While this may not be as nice as the infinite height adjustments seen on more expensive hoops, this hoop will suit the needs of many families with children who are looking to learn the game of basketball. Check out our full review of this hoop here. Lifetime’s 52 inch Shatter-Proof Portable Basketball Hoop is made with a spring enforced rim that has spring-back action. The hoop’s height can be adjusted from the front by squeezing height adjustment handles so that anyone is able to change the height of the hoop. Height range of this hoop is 7.5 feet to 10 feet. A feature that is also noteworthy is 3.5 inch diameter powder coated three piece support pole. This portable basketball hoop also provides a rolling base so that the unit can be moved easily to wherever you need it. The extra large base is designed to be filled with water to provide a stable base to keep the hoop from tipping which enhances safety. While the backboard does vibrate on bank shots, it is minimized by the two backboard braces. This is another great option for families who have a little more money to spend, but are still looking for a high quality value basketball hoop. The Spalding NBA Hybrid Portable Basketball System brings a new spin to the portable basketball system. With this basketball hoop the base is a hybrid which is filled partially with water and with 200 pounds of rocks or sand for the other half. This makes storage and transportation even easier than other portable basketball hoops. 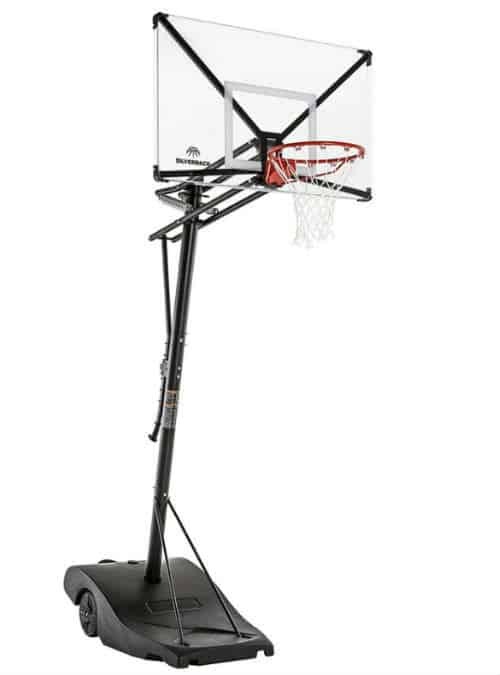 Beyond this the Spalding NBA Hybrid Portable Basketball System also features a 60 or 54 inch acrylic backboard and an arena slam rim. The hoop also has a base cover and padding running along the bottom of the backboard to enhance player safety. Reviewers state that the hoop is high quality but is difficult to assemble. Check out our full review on this hoop here. Our most expensive mid range option comes from Spalding. 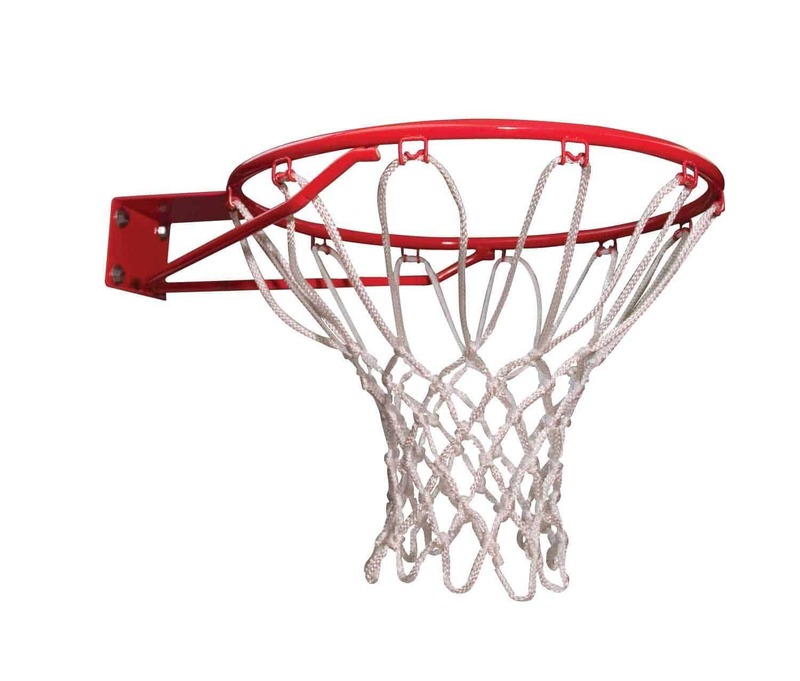 This portable basketball hoop features an arena style breakaway rim, and a heavy duty, powder coated, steel frame. The unit has a 40 gallon base which keeps the hoop from tipping over when you go in for the slam. Having the angled support pole allows for safe play and under the hoop action. As you can see this hoop looks very similar to the Spalding 68564, which we just reviewed. The main difference is the larger 60 inch acrylic backboard allowing for a larger shooting area. 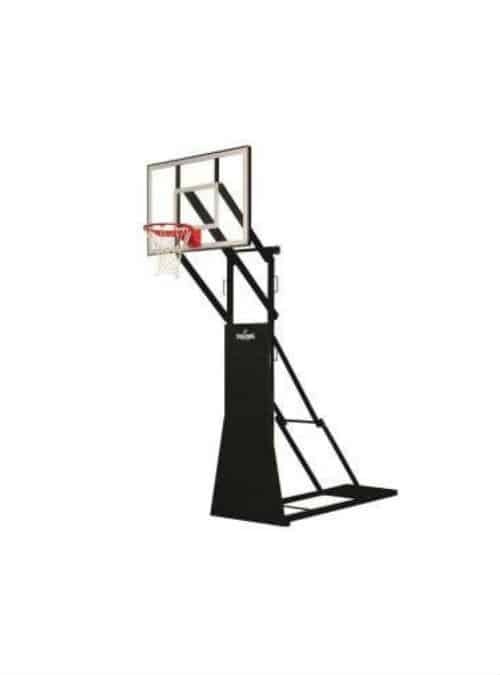 This hoop can be adjusted from 7.5-10 feet in height so that young ones can develop proper shooting skills as they grow. We recommend this hoop for serious and developing players who plan to consistently practice and work on their game to get better. Read our full review about “The Beast” basketball hoop here. 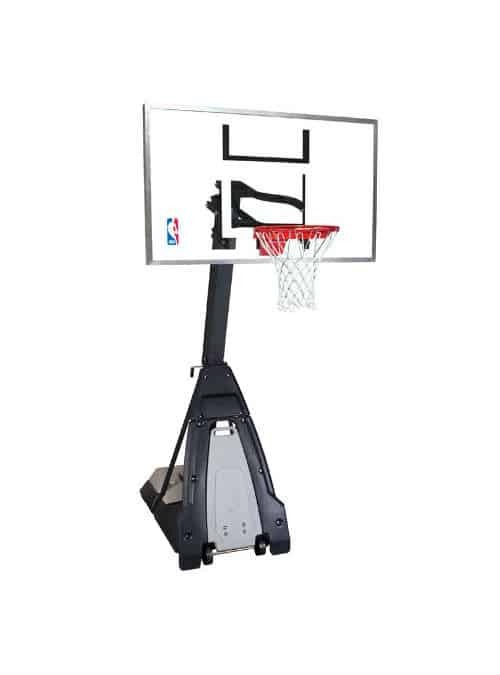 The Spalding Beast 74560 Portable Basketball Hoop with 60 Inch Glass Backboard features a two piece, 5 Inch square angled pole system with a screw-in water level gauge base cap, a 60 Inch tempered glass backboard, and the Pro Image breakaway basketball rim. The two piece support pole system offers a great deal more support and rigidity when compared to their three piece competitors. Tempered glass is the absolute best backboard material and is very responsive when shots hit the backboard. 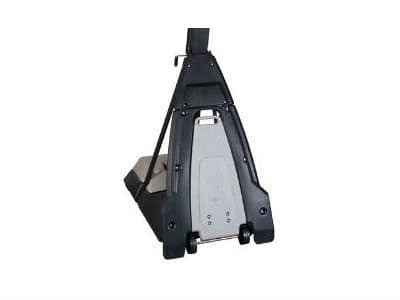 The Spalding 74560 Beast basketball system adjusts from 7.5 feet to 10 feet with an easy to use screw jack adjustment system and is easily portable using the multi-wheeled castors with engaging handle. We would like to see backboard padding on this hoop, which it currently lacks. However, the simple truth is that this hoop is awesome for any home. Consider buying this hoop if you have the budget and are truly serious about the game of basketball, but need a hoop that can be transported if necessary. 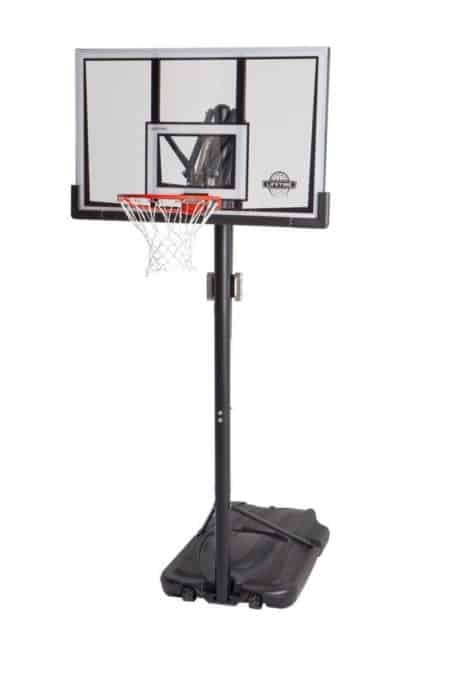 The Spalding Street Tournament Side Court Portable Basketball Hoop is for those looking for a truly durable and long lasting system that can take on recreational and tournament play. The cushioned backstop helps to protect players driving to the hoop during an intense battle. There is also a 3 foot offset so that this hoop plays and feels like an official gym bucket. We also like that this hoop can be folded down to improve storability. So, if you are hosting a tournament or summer league games, then there is no substitute for this hoop produced by Spalding. The First Team Fury is a very high quality portable basketball hoop with unique features. It has an amazing adjustable height range of 6.5 to 10 feet. What we feel is the best thing about this hoop is its unique folding feature that makes it much easier to move than the other hoops on this list. It also comes with a breakaway goal so that it can take any high flying punishment you can dish out. It also features a 48 inch extension from the hoop to the pole as to ensure safety. This hoop works great for both indoor and outdoor environments. 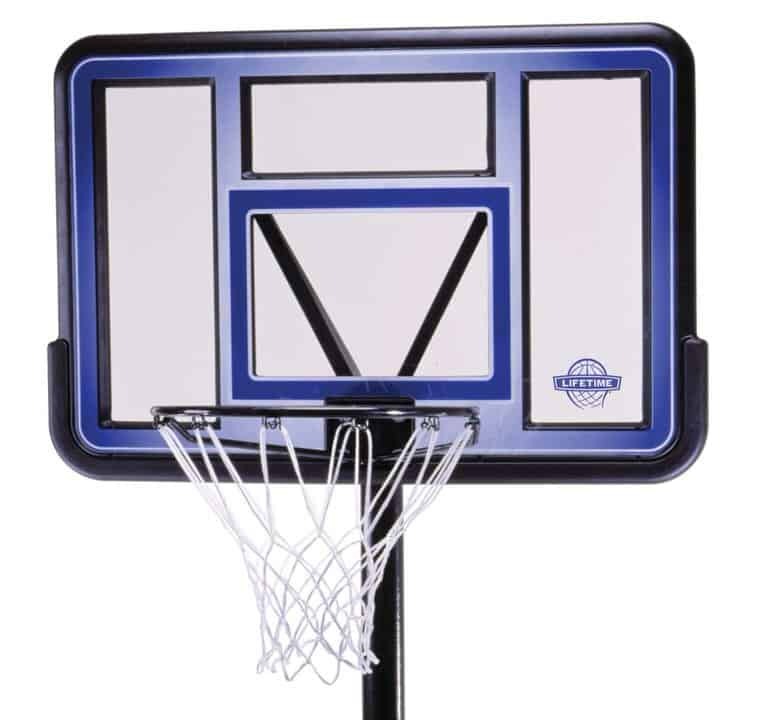 Our biggest complaint about this hoop is its relatively small sized 48 inch backboard. Yet the craftsmanship of this hoop cannot be underestimated and will last for many years with normal use. What Should You Look for In The Best Portable Basketball Hoops? 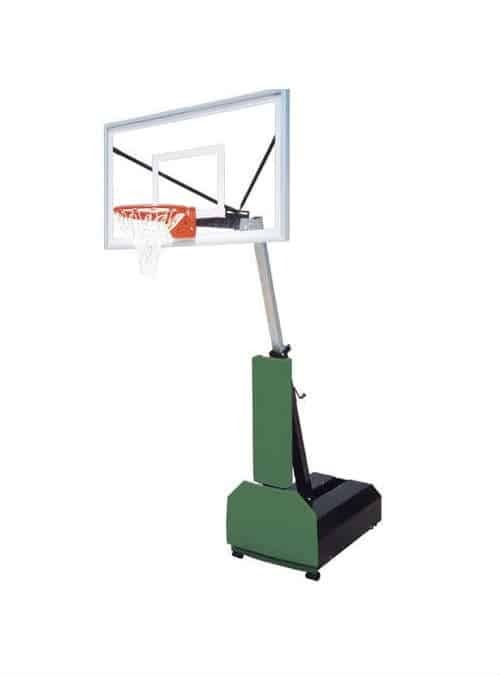 Portable basketball hoops come with backboards of different sizes and materials. Generally, the smallest backboard we could find on a portable basketball system is 44 inches. For residential portable basketball hoops 60 inches is likely to be the largest backboard you will find, like the one featured on the Spalding The Beast Portable Basketball System. The majority of homes looking for a portable hoop for recreational use will find a 52 inch backboard to be very satisfactory. While backboard size is the first feature that comes to mind for many buyers when looking to buy the best portable basketball hoop, we believe that an even more important factor is the portable basketball hoop’s backboard material. 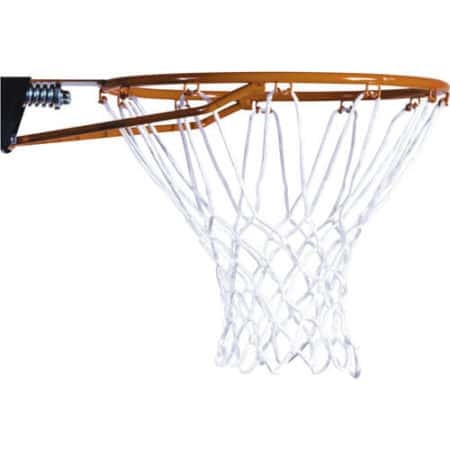 Most inexpensive Lifetime and lower priced Spalding systems will have a backboard that is made of a polycarbonate material. Polycarbonate is extremely durable and will be unlikely to break if tipped over or during rough play. However, while durability is a strength for polycarbonate backboards, performance is a big weakness. Portable basketball hoops with polycarbonate backboards often tend to have a “dead” feel when the basketball comes off the backboard during shots. This significantly changes the way rebounds play on cheaper polycarbonate backboards compared to top end tempered glass backboards. Generally we recommend portable basketball hoops with polycarbonate backboards for families who want to use the basketball hoop for recreational play and for young children learning the game. The middle tier backboard material that is found on many portable basketball hoops today is acrylic. Acrylic backboards are less durable than their polycarbonate counterparts but perform much better. 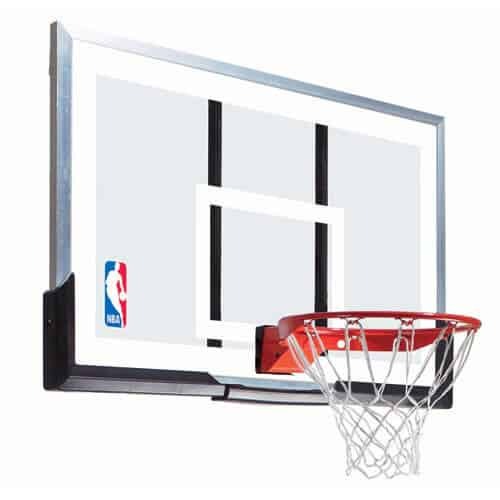 Acrylic backboards are generally featured on middle priced portable basketball systems that offer a greater number of features. If you take the game seriously but live in an area where severe weather, including high winds, can occur then we would suggest considering a portable basketball hoop with an acrylic backboard. 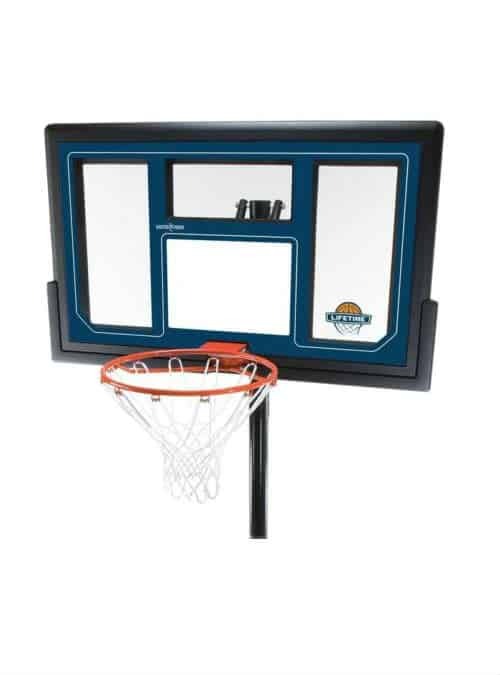 When you are ready to dig deep into your wallet and will only accept the best portable basketball system, then it is time to invest in a hoop with a tempered glass backboard. Tempered glass is the real deal and is the type of backboard used on indoor hoops across the country. These backboards perform better than both acrylic and polycarbonate materials. Portable basketball systems with tempered glass will have rebound performance that is superior and will be more game like. The biggest issue with tempered glass backboards is that they are susceptible to shattering. For this reason we would recommend that if you are going to spend the money to buy a portable basketball hoop with a tempered glass backboard that you closely assess the likelihood that hoop will be tipped or mistreated. There are three main types of rims that you will see on modern portable basketball systems. Each has pros and cons which are important to consider when selecting a hoop. The standard basketball rim has been around for several decades. It has no compression springs making it more susceptible to breaking or warping if dunked on over time. If you do not plan to use your hoop for dunking and do not plan to spend much money, then we would suggest you purchase a hoop with a standard rim over a portable basketball hoop with a cheap compression spring as the standard rim tends to have better performance than those with a cheap single compression spring. The next step up from the standard rim is the breakaway rim that features compression springs that are exposed. These rims are better able to take mild to moderate dunking without becoming damaged. They are still not good for harder dunks or rim hanging. These cheaper compression rims do have a tendency to be a bit more “bouncy” than we prefer. Also, because the springs are exposed there is a greater chance that they will rust over time, which diminishes the rim’s performance. 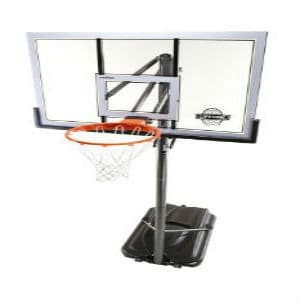 When it comes to portable basketball systems, the best portable basketball hoops come with professional grade breakaway rims that have the springs protected in a box that connects to the backboard. These rims are generally able to take a lot more punishment than the cheaper rims. Even though this is the case we still recommend limiting the amount of rim hanging you do to avoid damage. These pro-style rims will also bounce much less on a shot compared to the cheaper compression rims. In our opinion the base is a very underrated feature of the best portable basketball hoops. The budget portable basketball systems come with bases that are generally 27 gallons. This will keep the hoop upright during most circumstances, but could be tipped in high wind weather and when dunking. Mid-priced portable basketball hoops will have bases that can hold up to between 35 and 40 gallons of water or sand. These portable basketball systems will be harder to tip and will provide significantly more stability during play. The best portable basketball hoops have bases that can be filled up to 50+ gallons. These bad boys have maximum stability and will stay in place under almost any conditions. Be sure to check to see if the portable basketball system you are looking to buy has wheels on the base. This will make any transporting of the system much easier. If you live in a location where the weather gets cold, mix a little anti-freeze in the base if you fill it with water to keep the water from freezing and expanding which can destroy the base. Lastly, look for a portable basketball hoop that has a protective plate in front of the base (like this one). Many injuries occur due to players tripping or running into the base during games. Having a quality support pole system on a portable basketball hoop is central to keeping the whole system stable when in use. 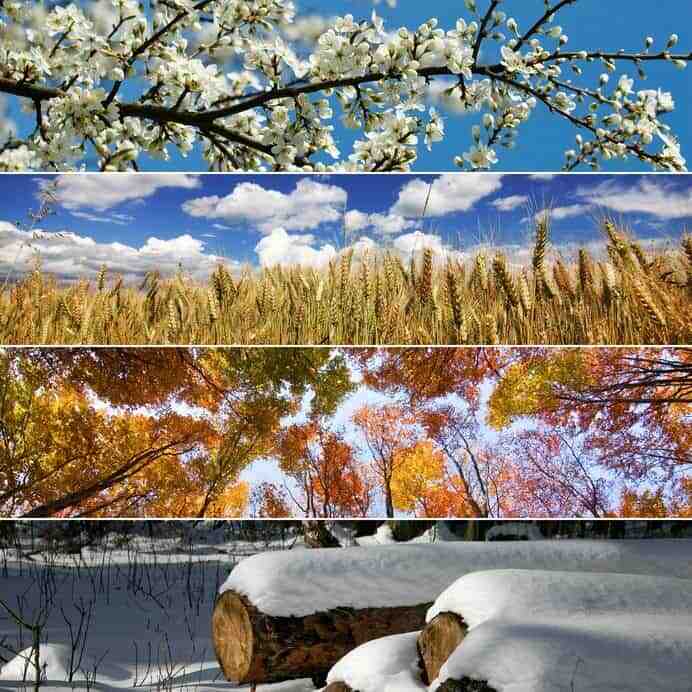 There are three main support pole designs: three piece, two piece, and one piece. Three piece support poles are typically found on budget and middle tier portable basketball hoops. This is the cheapest design and will result in the most amount of hoop shaking during play. 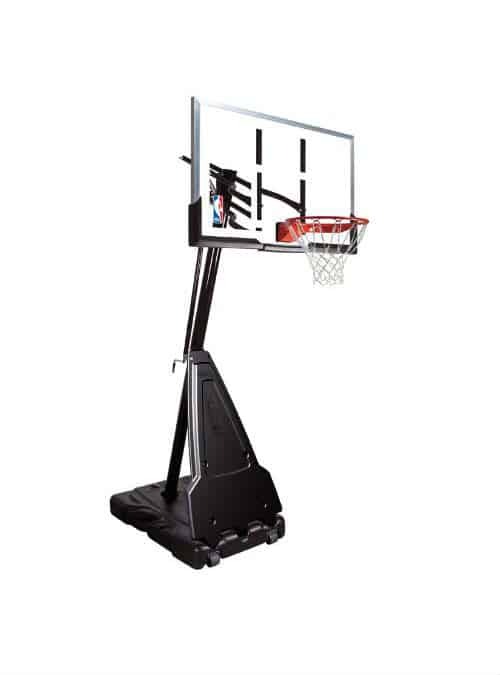 Two Piece support poles are generally found on high end portable basketball systems. These have significantly more stability compared to three piece support pole systems and will be able to take more abuse. 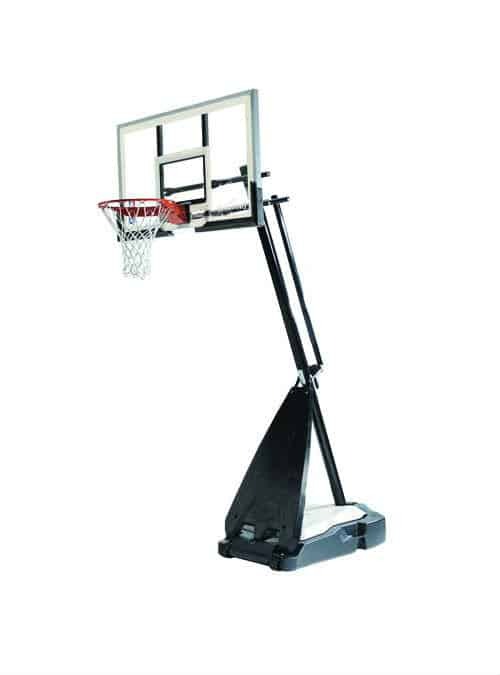 One piece support pole systems are unlikely to be found on portable basketball systems and are generally only found on the top of the line in ground basketball systems. 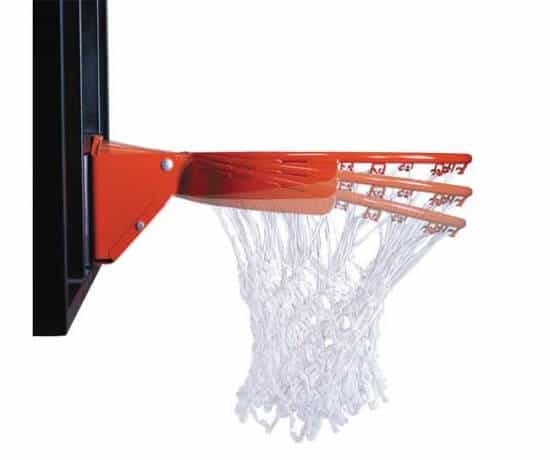 A backboard’s performance can be enhanced when there is proper support bracing within the portable basketball hoop’s design. These braces will generally be in the form of metal pieces that either connect to several portions of the backboard or lineup parallel to the backboard. Because portable basketball hoops rely on the fill base to keep them upright it is important to consider the weather in your local area. Do you sometimes have severe storms or high winds near your home? If so, you’ll want to buy a portable basketball hoop with a base that is large enough to keep your hoop from tipping over during these weather events. When the weather is bad in your area be sure to lower your hoop’s height to the lowest setting to give the system a lower center of gravity, making it harder to tip. High rain and humidity areas may also cause your hoop to rust over time. If you live in high humidity areas I recommend buying a hoop that has a rim with covered springs to protect the rim’s integrity from the elements. It stinks, but the reality is that how much money you have to purchase a hoop will impact what system you buy. Those with deeper pockets will have access to the nicest portable hoops like the Spalding Beast, while the rest of us may have to settle for a decent but less impressive Lifetime Hoop. In my list, I’ve tried to compile the best portable hoops for each price range, so I hope that there is a hoop here that will meet your needs and your budget. Not everyone needs the biggest and best basketball hoop for their home. If you are a mom or dad and want a hoop for your kids to play on for fun, then by all means pick up a good lower cost hoop and watch them enjoy the game of basketball at a recreational level. For those who are serious players or are committed to developing their skills, then make the portable system you buy a bigger priority by preparing to spend more for a better hoop. Look for hoops with enclosed spring rims, acrylic backboards or better, and a large fill base. 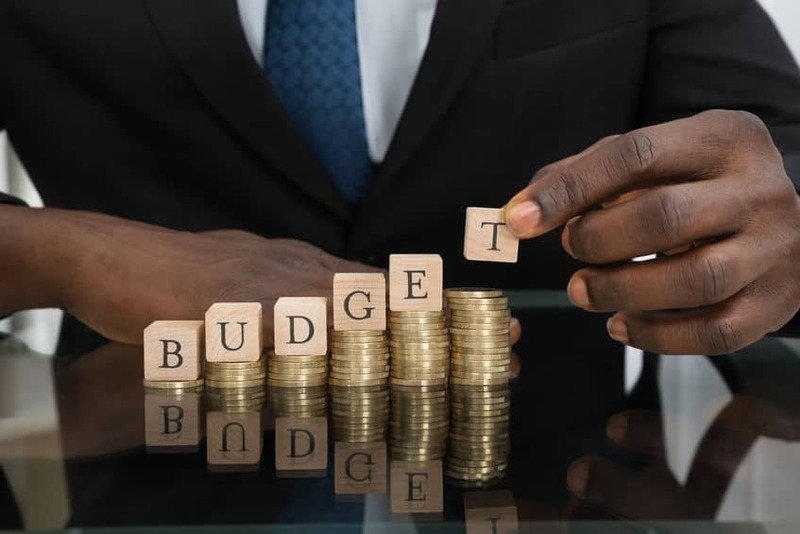 You’ll be spending hundreds of hours using this hoop and it is best to spend more now and get something that will last as you grow your skillset. 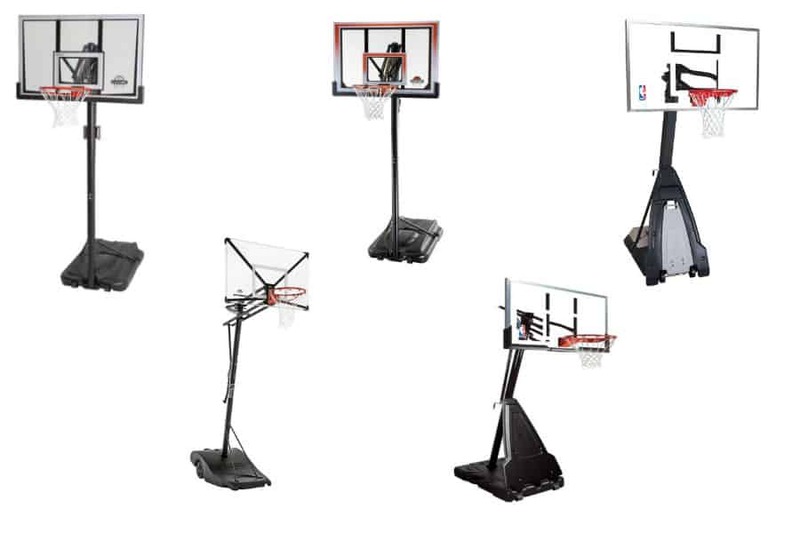 Be sure to consider all of these factors when choosing which portable basketball hoop to buy. We hope this guide has been helpful and we welcome feedback using our Facebook page! This really depends on the model of portable basketball hoop that you've purchased. In general, cheaper units will take less time to assemble (~1-2 1/2 hours) while premium systems will take longer (~2 1/2-4 hours). As with time, cheaper portable basketball systems will take less manpower than more expensive units. For hoops under $500, most able bodied adults will get by on their own give or take a couple steps in the assembly process. For a larger hoop, we recommend having two adults available to assemble. The best choice is a paved driveway or court that is fairly level. A street might work, but there are safety concerns given traffic. If nothing else a gravel driveway would work. 5. Which portable basketball hoops from the list are easiest to move? A few of our top picks would be the Silverback NXT, Lifetime 1529, and Spalding Hybrid. In my personal experience, this is the most difficult part of the hoop assembly process. If you have difficult putting the support pole pieces together I recommend covering the pole with grease or WD40 to minimize friction. If possible, store the basketball hoop inside a garage during the cold season. Every year coat the most susceptible areas of the hoop with this corrosion inhibitor from WD-40. This includes any bolts, joints, and the rim. 8. Can I dunk on a portable basketball hoop? I do not recommend dunking on any portable basketball hoop as a means to protect the system long-term. However, the Spalding Beast is the only portable basketball hoop I know of that can withstand the force of dunking effectively.